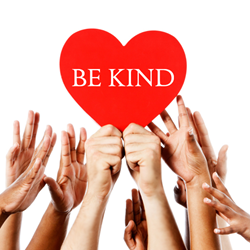 Brookhaven Retreat ® LLC, a unique residential treatment facility exclusively for women with mental health and/or substance abuse issues, will offer clients suggestions for observing and celebrating Random Acts of Kindness Day on February 17, 2016. A little kindness goes a long way among clients of Brookhaven Retreat, who may be tending to addiction, the post-traumatic stress of an abusive relationship, the loss of a loved one, mental illness or a variety of other possible difficult circumstances. Kindness on both the giving and receiving ends of the equation has the power to heal. The greater your kindness, the more profound your healing power will serve you and everyone around you. According to the Huffington Post, an extensive scientific literature review sponsored by Dignity Health and conducted by the Center for Compassion and Altruism Research and Education (CCARE) at Stanford University reveals scientific evidence of kindness as a healing modality. The Dignity Health/CCARE scientific literature review claims that patients treated with kindness, empathy, interest, communication and response to their needs, they experienced faster healing of wounds, reduced pain, reduced anxiety, lower blood pressure and shorter hospital stays. Offer compliments to help others feel special and appreciated. Be encouraging, knowing you're on similar paths to healing. Respond when you notice someone in need of physical help. Be a good and patient listener when talking with someone. Use your own talents for someone else's benefit without asking anything in return.